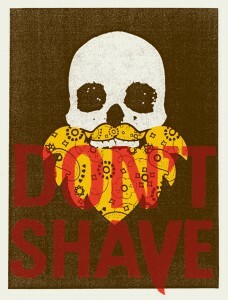 So it is with heightened interest that Mr. Scatter notes the opening of Keep Portland Beard, an exhibition of hairy art that opens Monday at The Tribute Gallery near downtown Portland and will luxuriate through May 1. Mr. Scatter has been seeing a lot of minimalism and a bit of Papa Murphy’s art of late (it comes half-baked, and you’re supposed to finish it at home in the oven of your own mind), so the chance to catch a show that glorifies excess suggests a welcome break. Mr. Scatter tries to keep his own beard well-trimmed, with varying degrees of success: Sometimes it’s just too much bother. 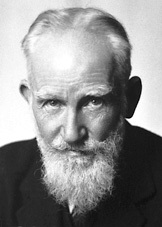 He recalls the story, perhaps apocryphal, about George Bernard Shaw as a lad, observing his father in mid-shave. “Why do you shave your face, Papa?” the little critic is supposed to have asked. Father Shaw stopped, held his razor in mid-air, turned to his son and replied: “I’ll be damned if I know.” Then he wiped the lather from his face and never shaved again. Or so we recall the tale. Keep Portland Beard is the brainchild of Michael Buchino, proprietor of the quirky online Beard Revue, which displays and grades public displays of hirsute vitality. No, we didn’t know it existed, either. After happily wasting a few minutes at the site, we’re glad we know now. Buchino has curated a show that includes artworks by Rachel Caldwell, Erin Dollar, Chad Eaton, Chris Hornbecker, Jamie Reed, Ashley Goldberg, Bryan Keplesky, Brooke Weeber, Ian Seniff, Kyle Durrie, Lloyd Winter, Santiago Uceda, BT Livermore and Patrick Weishampel, in addition to himself. You can see their bios here. And if this seems to you like a thin idea for an art exhibition, give it a chance: It might grow on you. I love the title of this article. This bearded fella seems like a genius. Glad he takes grooming his beard seriously. I just started my own site dedicated to providing affordable beard kits for men and would love to know what people think and how we can improve. Thanks.